I haven’t been able to post in several days. I have a number of thing written, and will be posting them as I can. They will be out of order for the most part, so don’t let the order of events confuse you. Today was a really good day. I will probably write several posts about today, but for now I am only going to focus on a couple things. This is now my fourth time in South Sudan. My second trip was exceptionally hard for a number of reasons. It was shortly after the referendum passed and South Sudan gained independence from Sudan. There had been electricity in the air before the referendum, because everyone was excited about gaining their freedom. The second time I went, independence had been gained, but the hard realities had set in. Independence meant that first you had to learn how to be independent, and conditions had deteriorated since my first visit. Part of this deterioration can be seen in a video I shot, which I may or may not be able to post depending on where impost from. 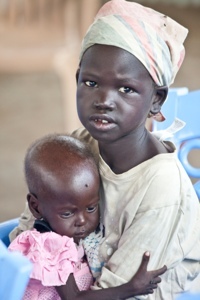 I met a little girl holding her starving, sick sister. I rubbed her head with my hand, and she was burning hot. I had tears in my eyes as I prayed for her, and I was certain she would die soon. On my third trip, I didn’t see her. Today, despite my lack of faith when I prayed for her, I saw her in church. She was still being held by her sister, but this time it wasn’t because she had to be. She was healthy and strong. Praise God!